Artist Mark Vallen's essay on George Grosz. George Grosz was an amazing painter, illustrator, and caricaturist who combined his artistic talents with an uncompromising radicalism. Grosz detested the bourgeoisie of Germany, and continually attacked and mocked them with his caustic pen drawings. With exacting skill Grosz documented 1920's Germany and the rise of fascism, until he was forced into exile by the Hitler regime. 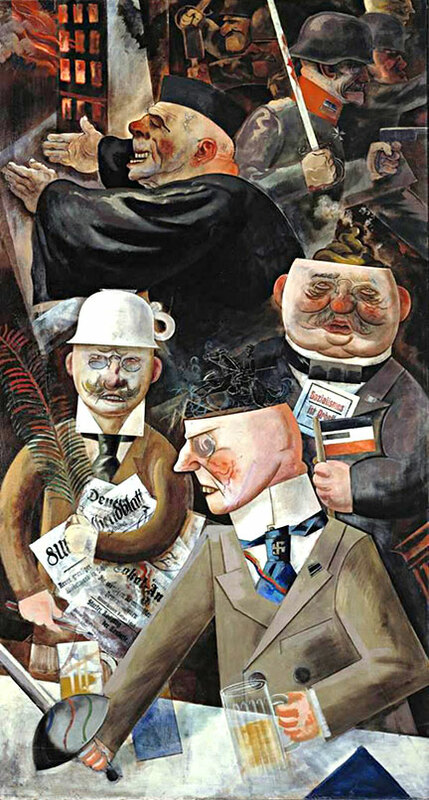 Grosz's painting at left, Stutzen der Gesellschaft (Pillars of Society), is a deeply sarcastic portrait of the German elites who supported fascism. Pictured front and center is a Nazi holding a beer mug and a sword, behind this figure sit two members of the bourgeoisie, one holding a blood stained palm leaf and the other's head opened to expose a steaming pile of excrement. A pompous pro-Nazi priest stands in the background, blessing the murderous actions of the army. By the time Grosz had painted this work in 1926, he had already created many vitriolic denunciations of the ruling class. He had participated in the early Dada movement, founded along with John Heartfield the satirical magazine Die Pleite (Gone Bust), contributed illustrations to numerous left-wing publications, and like many other artists, joined the just formed German Communist Party (KDP). Grosz was on a trip to the United States when the Nazis came to power in 1933. The artist received word that the fascists had come looking for him at his apartment and at his studio. Grosz would not return to Germany until 1954. He died in Berlin in 1959. In 1921, Grosz offered this advice to artists; "Come out of your rooms, even if you find it an effort, pull down your individual barriers, let yourselves be caught up by the ideas of working people and help them in the struggle against a corrupt society."